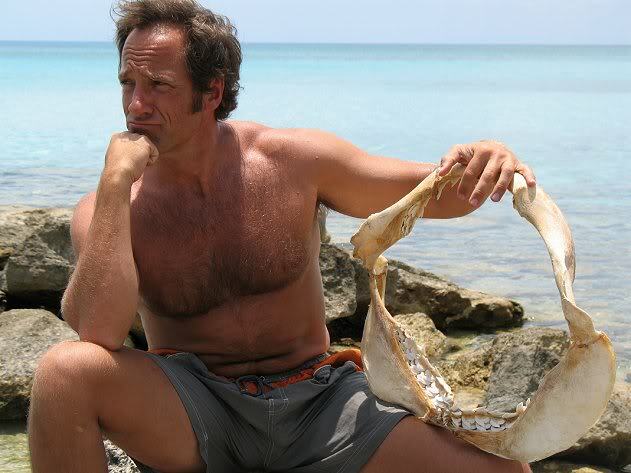 We found some new shirtless and hairy pics of Mike Rowe and had to share them. If only that towel would’ve slipped off. We also have a pic of his giant bulge and we will be posting that soon. You gotta love this shirtless picture of Mike Rowe from ‘Dirty Jobs’. Relaxing on the beach and showing the world his nice hairy chest. Since ‘Dirty Jobs’ Mike has been appearing in different ads and commercials and recently became the spokesperson for Caterpillar. Mike Rowe is one of our favorite hunks on TV. You probably know him from the Discovery Channel and his show ‘Dirty Jobs’. There’s been a few episodes where he appears shirtless and exposes that hairy chest of his. Mike Rowe gets down and dirty on Discovery’s Dirty Jobs, and the thing we love best about the show is he frequently has to take his shirt off to get cleaned up.